A swing and a miss! You love tugging that little line, drawing the bounteous piñata higher and higher as the blindfolded batter swings low. Or loosening your grip to ground the piñata as she swings high. You chuckle and chuckle at your clever dodges and revel in the laughter of the crowd. Until it’s your turn at the bat. Now the crowd has turned against you as you beat the air, hoping against hope that candy will shower you with sugar. You can taste victory…but can you find it in the dark? 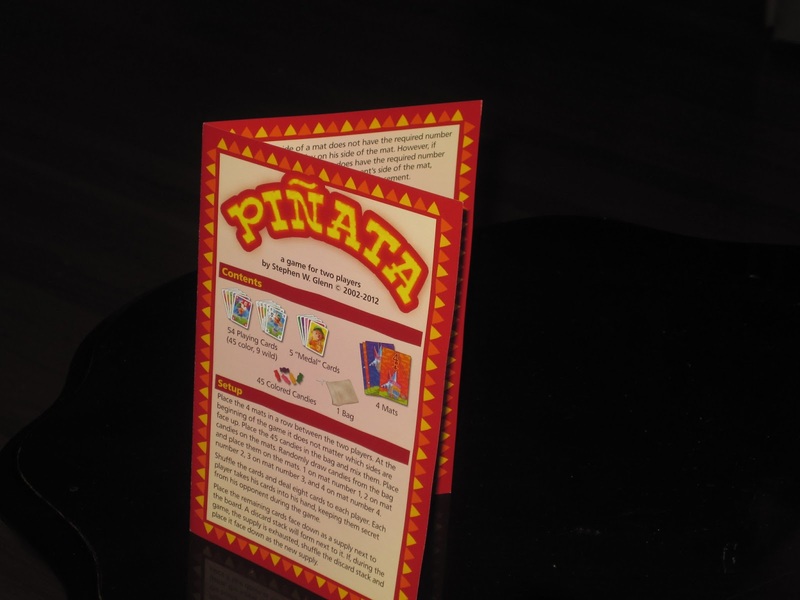 Piñata is a set collection/hand management game for two players, ostensibly about winning medals for getting candy from a piñata. There are five medals matching the five colors of candy, and the first player to collect three medals wins the game. These are what you’re after: the medals. 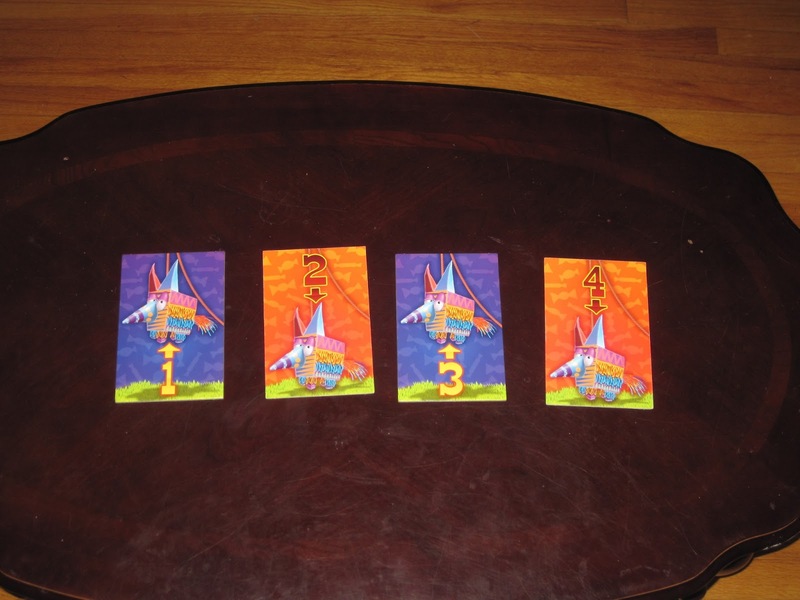 To begin the game, players place the four numbered piñatas in the center of the table. 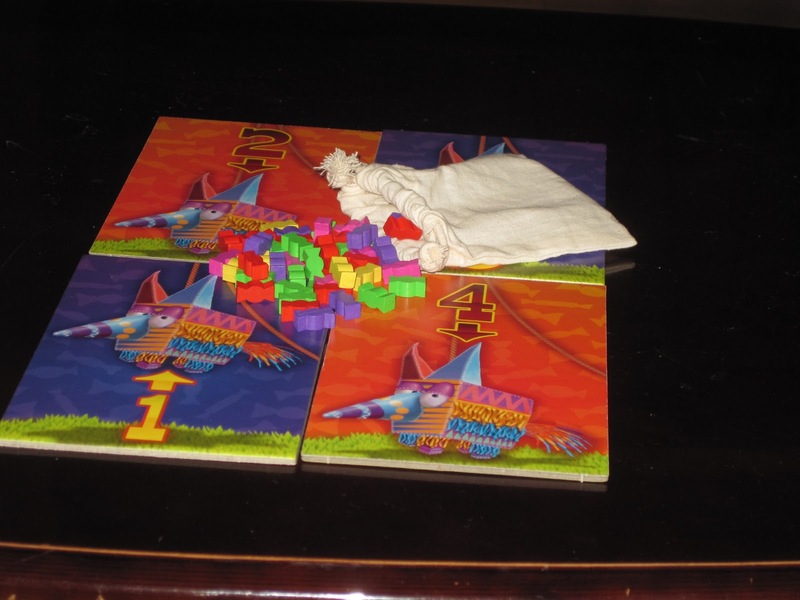 Players draw candy pieces from the included bag and place the candy on the piñatas according to the number on the piñata (for example, one piece goes on the 1, two pieces on the 2, etc.). Players are dealt a hand of eight cards. 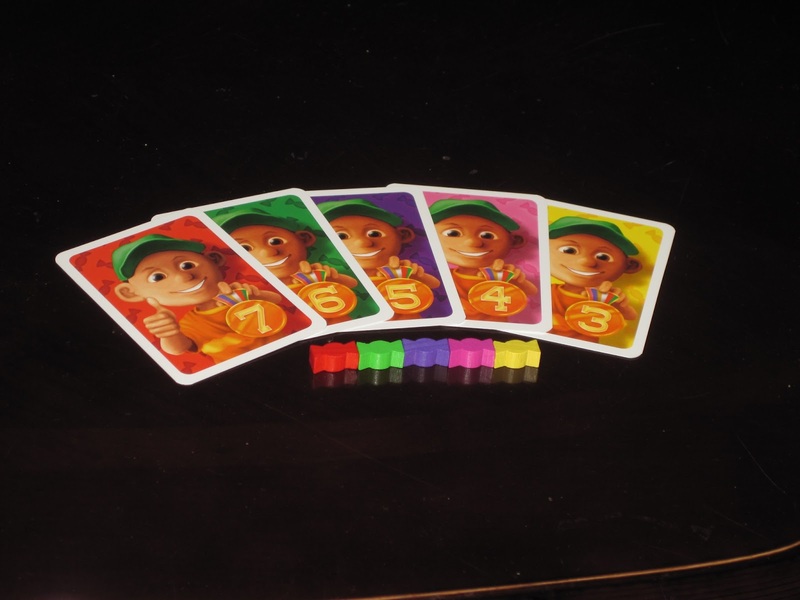 Players must play cards that match the color of candy on a piñata (so, for example, if a red and a green candy are on the 2 piñata, players must play a red and a green card [or wild cards]). Players must play on their side of a piñata until no more matching cards can be played on their side; then they may play on their opponent’s side of a piñata. Once no more cards can be played on either side of a piñata, the piñata is scored. Each piñata is double-sided and has a red and a purple side. If a piñata is on the red side, the lowest total will win the candy on the piñata. If it is on the purple side, the highest total wins. Once a player claims the candy on the piñata, the piñata is turned over, and new candy is placed on it. Players claim medals as soon as they reach the threshold for that medal (so, for example, once a player has at least three yellow candies, he or she claims the yellow medal), and each medal has a different threshold depending on that candy’s scarcity. The game ends when one player has claimed his or her third medal, winning the game. Empty Insides or Candy Windfall? So what do I think of the game? I think Piñata, while not perfect, is a fun, fast, tense, and ultimately satisfying two-player game that doesn’t outstay its welcome. The candy pieces and pinata mats are fantastic. And the candy looks delicious. The components of Piñata are quite nice. The piñata boards are big and chunky and seem like they will last (though the board colors occasionally make the candy pieces hard to see). The cards have a matte finish and shuffle well. They seem about the same quality as the cards used in Agricola, which is fine in my book. The colors on the cards are clear, and the artwork, while cartoony, is evocative. (Though, to be honest, while the artwork is thematic, I don’t really look at it during the game; I’m too concerned about what my opponent is doing.) But the best aspect of the components is the candy pieces. The game comes with a drawstring bag containing small wooden candy pieces. This is a great touch, and it keeps a game for which theme is not central within the context it sets to create. The box, while not pocket-sized, is small enough to allow for easy toting. Everything fits nicely back in the box. The game itself has super simple rules. I was able to teach my wife the full game within a few minutes, and she was breaking open piñatas shortly thereafter. Yet even with these simple rules, the game offers a lot of options for clever play. The game is a tense back-and-forth over each piñata, and players must decide which piñatas to go after and which to sacrifice. 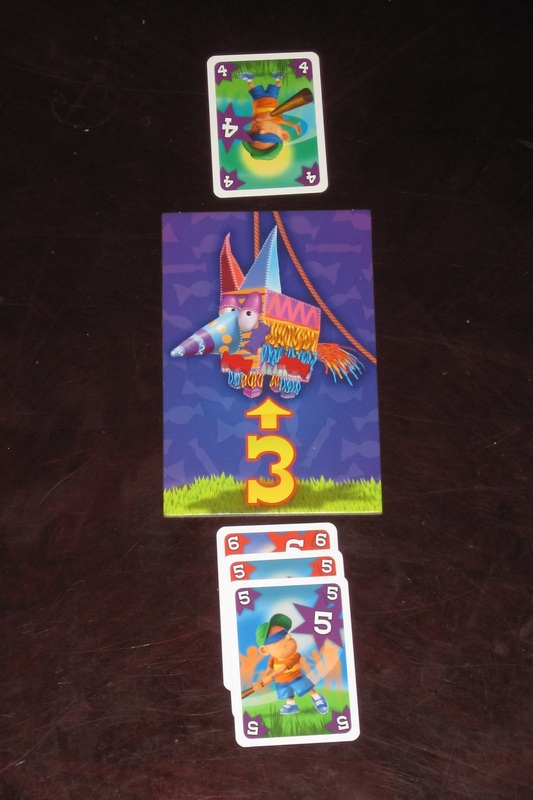 The reason the game is so tense is that once players have completed their side of a piñata, they may play (presumably bad) cards on their opponent’s side. The game itself is a race in that players are trying to collect the most candies of each color, but the individual piñatas are races as well: if your opponent is adding cards quickly to their side, you have to consider whether you can play quickly as well. If you can’t, it might be better to divert your resources elsewhere, especially as forcing your opponent to play cards on your side can waste several of their turns. Then again, your opponent may be bluffing, playing cards in quick succession without having all of the cards they need to complete it, hoping that you’ll abandon the piñata. The game has interesting moments of these think-double-think scenarios. “I clearly cannot choose the wine in front of you…” It keeps the game interactive. Another reason the game feels like a race is that each candy color has just enough pieces in the bag to break an even split for the medals, so the race to collect (especially hotly contested colors) is engaging. It’s true that snagging an early medal can relieve this tension, but in my experience the race to collect the medals has been exciting. The loss of even one candy piece before a medal is decided can be devastating, especially with the yellow and pink medals, which require only three and four pieces (respectively) to be claimed. 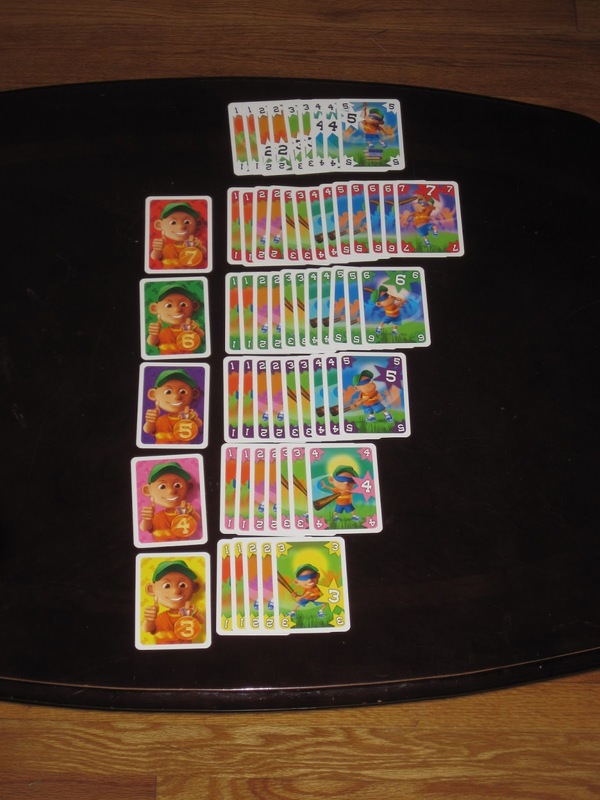 The cards of each color in the deck are also reflective of the number of candies in the bag, though the wild cards help to balance this out. Some people might not like the game because of the luck involved. The contested candy pieces are drawn randomly from a bag, and players receive cards by blind draws. And it’s true that players are somewhat at the mercy of these random elements (as in most card games), but usually this isn’t too much of an issue in Piñata. Since a player’s hand size is eight cards, there’s usually something that can be played that, even if not optimum, is not a bad option. And since both players are at the mercy of the cards, this serves to equalize swings of luck. Also, because the piñatas are constantly flipping between high and low, cards that are useless now may become just what you need once the piñata flips. And if a player is ever without a card to play, that player can draw a new hand (though this usually only happens near the end of the game). Gotta love a game with simple rules. That’s why I think Piñata is primarily a hand management game: you have to weigh what’s useful now with what might be useful later. Wild cards are huge boons, but for that reason, you don’t want to waste them early. Every card played matters, and while you don’t know what you will draw, you have to plan an escape route in case what you draw is unhelpful. 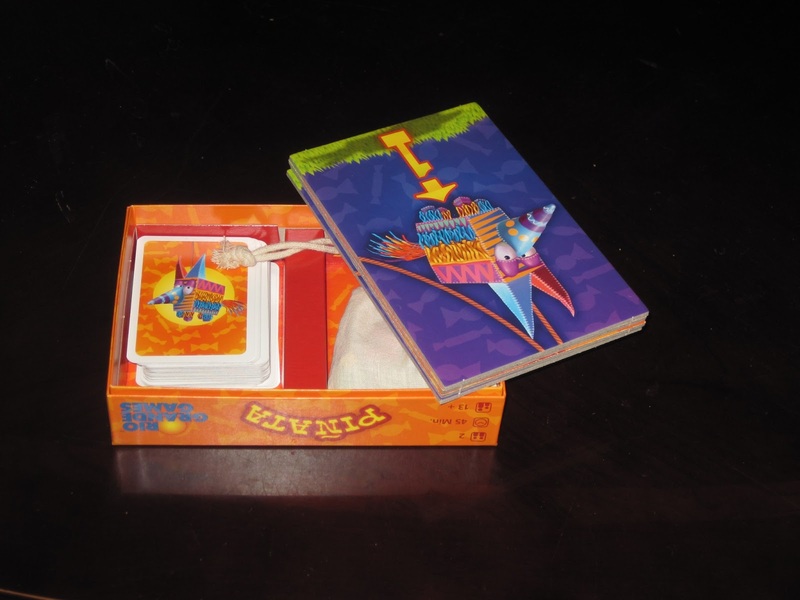 Similarly, it can be tempting to snag a piñata by playing on your opponent’s side as soon as you are able, but you have to weigh whether the cards you play now will be necessary for you later. I love that the game is full of these give-and-take, balanced decisions. Everything you decide has a consequence, and even if you don’t have complete knowledge (after all, you don’t know which candies are coming up or which cards you will draw from the deck), you don’t feel completely buffeted by the winds of fate, either. The game is full of calculated risks. Whether they pay off is ultimately decided by random draws, but that doesn’t eliminate the calculation that takes place first. The four pinata mats. Each has a purple and a red side. All told, Piñata is a very enjoyable two-player game. It’s not as thinky as some two-player titles, or as swingy as some others. It occupies a middle ground that, honestly, is the ideal place for my wife and me. She’s not often in the mood for meatier titles (like Agricola), and I’m often in the mood for heavier fare than some other card games we play. Piñata offers enough tough decision making to keep me happy, but it is also light enough that my wife doesn’t feel overburdened with options. And even if the game draws don’t go your way, the game finishes in around twenty minutes, and it’s easy to reset and play again. Piñata fills a similar niche to Lost Cities, another hand management game that we enjoy, though with a much easier score system. If you’re looking for a light (but not too light) and quick two-player strategy game, you should give Piñata a try. 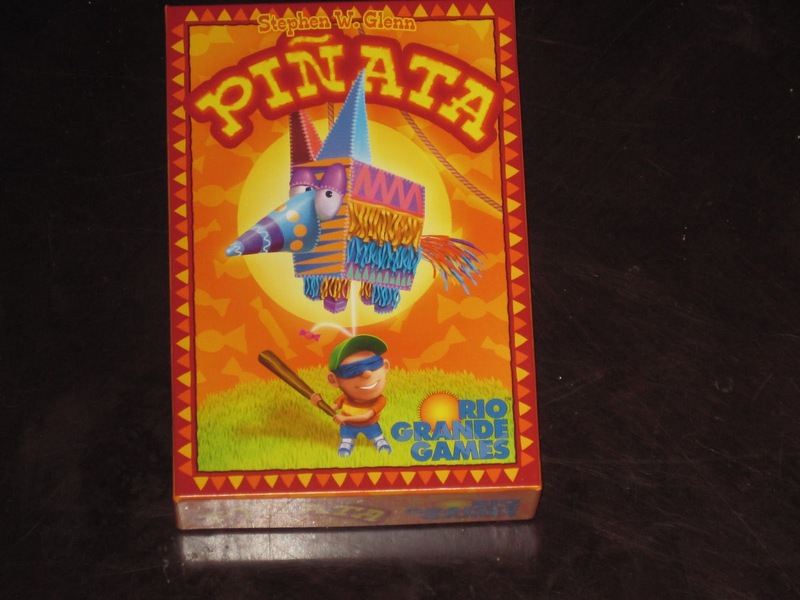 iSlaytheDragon would like to thank Rio Grande Games for providing us with a review copy of Piñata.